The worst bus accident in American history occurred on May 14, 1988. First Assembly of God Church in Radcliffe, KY sponsored a youth trip to King’s Island amusement park on a former school bus. Outside of Carrollton, KY, at around 11PM, a black Toyota pick-up truck, driven by an intoxicated Larry Wayne Mahoney, struck the bus nearly head on. The intoxicated Mahoney had been driving in the wrong direction on I-71. The crash disabled the front door of the bus and ruptured the gas tank. 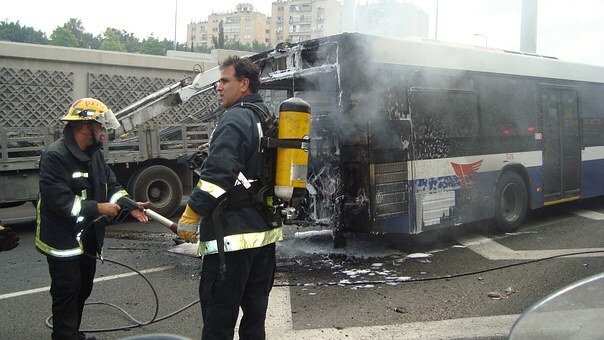 Within minutes, the bus was completely engulfed in flames. Of the 66 passengers, 27 died on the bus, 34 were injured—most severely. Mahony was sentenced to 16 years in jail. Incidentally, two of the mothers of crash victims, Karolyn Nunnallee and Janey Fair, became President and Vice President, respectively, of the National MADD (Mother’s Against Drunk Driving) Association. But perhaps one of the worst road accidents involving as many as 104 vehicles took place on November 29, 1991. A large number of travelers were returning home from the Thanksgiving holiday weekend. Along with a huge volume of traffic, there were gusts of wind of about 40 miles an hour along the I-5 California. The fierce wind resulted in a fierce dust storm that severely hampered road visibility. This all led to a pile up of 104 vehicles, including four tractor trailers, along a one mile stretch of highway. After hours of rescue efforts in the continuing dust storm, 17 people had died and 150 were seriously injured. The pileup led to thousands more being trapped in their cars for another day while road crews cleared the wreckage and worked to re-open the highway.